Which is causing some dispute. Comic readers may remember Platinum Studios as a company better at getting hype than publishing comics and with a history of shady dealings. 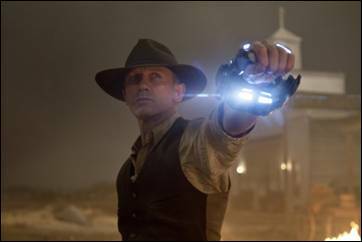 I best remember this particular publication, the Cowboys & Aliens comic, as something that faked its way to the top of a bestseller list by the company paying retailers to take their comic. Now, those writing credits have gotten some negative attention. Eight writers and writing teams have worked on Cowboys for several studios dating to 1997. … That [based on line] isn’t sitting well with writers who toiled on the screenplay years before Rosenberg’s comic — based on the film concept — came out in 2006. The actual comic credits say that it’s written by Andrew Foley and Fred Van Lente with artwork by Luciano Lima, but it appears from the webcomic treatment that the comic was never that important to the company anyway.